Leigh Harrison gets a first taste of what the new Playstation 4 can do. It took me around 25 minutes to give up on Knack on normal difficulty. Kid-friendly mascot games are a lot like those creepy guys our parents warned us never to talk to as children. Glover, Awesome Possum, and Croc might at first appear harmless, bouncing around with their candy-filled pockets and van-loads of puppies, but it’s all a ruse. Once you’re suckered in by the bright colors and jaunty music, they reveal their cold, dark hearts. Mascot games are pure evil—purveyors of pain, heartache, and inscrutably punishing difficulty curves. On easy, Knack is a lot less intimidating than the trench coat outside your bedroom window, but no more enjoyable company. Four years removed from its release, it looks far more like a product than a game. An extended advertisement for a youthful PlayStation and its flashy graphics, Knack was never meant to set the world on fire. But while it is derivative and bland, there is magic to be found in its low stakes, should you go looking for it. Goblins are attacking human settlements, pilfering the relics—ancient engraved rocks—that power everyday conveniences like cars, planes, and jackhammers. A genius doctor, known only as Doctor (he’s a good guy, despite having a name that suggests otherwise), has recently discovered a method of arranging relics around a sentient core. His experiments have created a champion: the latest super-duper, ultra no-nonsense, protect the meek, “I am Spartacus”, savior for the new console generation. Your friend and mine, known the world over for his heroic heroism—it’s Knack (the character), and Knack is AWESOME. Knack is essentially Ratchet and Clank rolled into one. This is of course wonderful, because Ratchet and Clank, along with their hilarious double entendre-laden game titles, are the—almost, after Knack—absolute best. Sometimes Knack is big and fierce and fights. And sometimes he is cute and small and runs around pushing buttons. His general conceit as a character is that he gets bigger. Relics are handily scattered about every level, acting as health pickups. But, and here’s the Knacking exciting part, every time Knack subsumes nearby relics he also gets bigger. He goes from being tiny and defenseless (Clank), to almost capable (Ratchet). 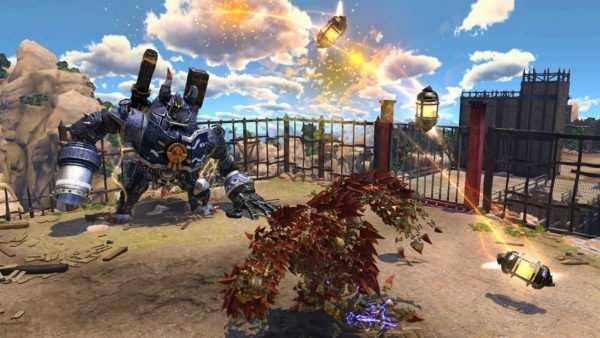 About 80% of Knack is fighting, which is strange considering its combat model comprises two solitary inputs. Knack can attack, and Knack can dodge. 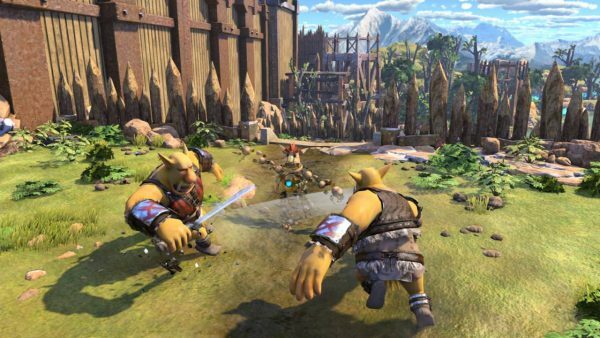 Combat is broken up into little arenas of up to a half dozen enemies, and Knack can only move on once everything is Knack smashed. Attacks are telegraphed nicely with wind-up animations and glowing weapons, which should theoretically make fighting a glorious ballet of fists, feints, and fun-damentally solid combat mechanics. It isn’t. The main problem with Knack is that Knack does not move well—as in chronically arthritic family pet drowning in your homebrew kit levels of not well. He’s slow, for starters, which makes closing in on enemies difficult. While windows of opportunity are, like attacks, clearly signposted, actually getting to that window is like dragging yourself to an oasis in the middle of the desert, an oasis that keeps getting further away because it doesn’t actually exist. His dodge, too, is bad. It’s marginally faster than his regular walk, but more a sidestep-around-dog-poop maneuver than a leap away from grenade-based mortal danger. The timing, distance, and urgency of it never feel right, and it often doesn’t get Knack far enough out of harm’s way to be effective. It’s a pretty bad dodge. Finally, there’s his jump-and-spin attack. Like a latter-day Sonic, it’s pretty much his best move. Press jump, then press attack, and Knack flies through the air as a ball of ancient engraved rocks at the nearest enemy. It’s far quicker than walking or dodging, more accurate than a punch, and, in an infuriating display of sensible game design, does less damage than a normal attack, to stop it being overpowered and the only thing anyone would ever use. The homing attack’s real downfall though, and there always is one with Knack, is that after connecting with an enemy, Knack bounces off them a fair distance. This is bad in a number of situations. Knack will, for instance, fall off platforms into other enemies’ attacks or certain death. Or Knack will bounce right into the path of a projectile. Perhaps Knack will ricochet into another enemy. Or maybe Knack will rebound into a laser and die instantly. At risk of running out of options for examples, Knack might even carom into one of those spike traps that are only in one level for some reason and also die instantly. At least one of these scenarios is possible in every combat encounter. Oh, and the checkpointing is cruel. It punishes every death with a retread of at least the previous two or three brawls before I get back to where I want to be. It’s like the entire game was designed by the bullies I called friends as an insecure teenager. 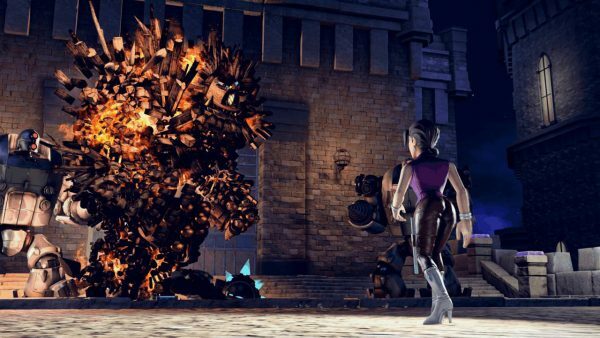 So what’s so good about Knack, then? In one word: ambition. More accurately and in four words: a lack of ambition. The game was clearly designed to be a tech demo for the graphical capabilities of the PlayStation 4 first, and a rootin’ tootin’ good time second. But this inadvertently grants Knack its biggest, perhaps only, saving grace. Every level follows the same basic structure, which is actually far better than it sounds. At the start Knack is tiny. He’s in a cave, or a mine, or a facility, or a goblin village. Because he’s so small he’s fighting spiders and bugs and birds with anger issues. After about 10 minutes, he’s collected enough relics to turn into Ratchet Knack. He starts fighting goblins wielding axes and boomerangs. Then he gets bigger again, and fights bigger goblins. These ones have swords and guns and are bigger than the smaller goblins. He keeps getting bigger throughout the level, until by the end he’s eaten so many relics that he’s as big as a Lower East Side tenement, and he’s punching robots, and tanks, and fighter jets, and actual tenement buildings. It’s like Rampage but not in a way that amounts to intellectual property theft. And this is why Knack is actually great. It’s the gentle, repetitive rhythm of its levels that kept me plowing through it. The early going of each level is uniformly the worst part. Little Knack dies easily, fights the game’s most boring enemies, and moves really slowly. But every time I was ready to give up, a little voice would pop into my head: “Stay strong, handsome, talented Leigh. In a few minutes Knack will be bigger and the game will get better again.” I was always right. The further into a level, the more fun Knack becomes, and that’s because of what I affectionately call growth points. Growth point [grōhth point] noun 1. The developer mandated area(s) [see: checkpoints] within a level of the videogame Knack where the character Knack becomes bigger and his character model and the enemies he encounters increase in size. As I pass a growth point, I begin to fight more interesting enemies with more interesting attack patterns. But I also still fight the smaller enemies that were previously dangerous and difficult to kill. Except now they squish as easily as a Cornish pasty sat unattended on a highway. Knack’s health also increases to ridiculous quantities, so things also become progressively easier. By the final 10 or 15 minutes of a level I’m bowling through cities throwing tanks through buildings without a care in the world, actually almost enjoying myself. The end of a videogame level should be harder than its beginning—it just should. But Knack doesn’t care. It’s a tech demo of a thousand ancient engraved rocks in the shape of a hugely popular console mascot—Knack (he’s a big deal). This lack of care is why our hero Doctor is just called Doctor. And why half the game takes place in uninspired caves. And why most enemies are reskins of other enemies. And why it’s definitely not a good idea to think about the game’s narrative. Our heroes might actually be the bad guys (right, Doctor? ), seeing as how their one aim is to retain a cultural status quo built upon humans requisitioning land from the indigenous goblins and moving them to inhospitable regions to live out a segregated existence. Don’t worry about it though, just look at all those lovely polygons!